The famous patterns of pop-art artist Romero Britto can be found on his crockery, sculptures and utensils. Delivered in original Britto gift box. Britto Theepot Spiral is a fill size ceramic teapot . Height 22 cm and packed in gift box. Cream & sugar set Flower, by Romero Britto. A lovely and colorful set to surprise your visitors. Material: ceramic, hand-painted. Height each 11 cm. Colorful mug Emotions Hearts by Britto,. porcelain, handwash only . Height 10 cm. 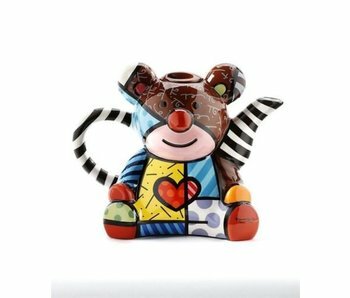 Comes in Britto gift box . Oldtimer vintage car by Britto is a brightly colored car made of ceramics. This collector's item is signed by Romero Britto. Height 9 cm, length 15 cm. Sports Car Spoiler is a brightly colored car made of ceramics. This collector's item is signed by Romero Britto. Length 15 cm. Mug with lid / coaster, packed in a gift box and includes a Britto label. Mug height 11 cm. Material: ceramic, new bone China. 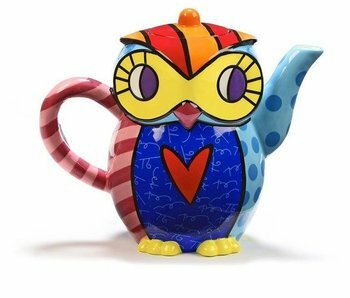 Teapot Owl, designed by Romero Britto and packaged in a colorful box design. The contrast of the colors combined with the stripes makes this piece interesting and whimsical. Height 22 cm. Cream & sugar set Flying Hearts, by Romero Britto. A lovely and colorful set to surprise your visitors. Material: ceramic, hand-painted. Size each piece: 10 cm x 15 cm. Only hand wash . 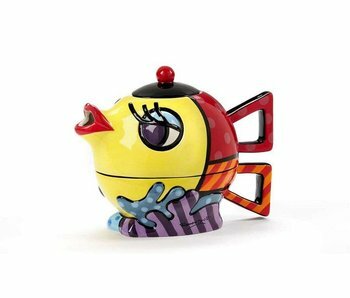 Tea for One Fish by Romero Britto. A combination of a small tea can and cup for 1 person. Comes in a colorful design package. Folding umbrella Deeply in Love by Romero Britto. Diameter 100 cm. Easy to carry with you in a bag. With cover. Duffel bag with drawstring in Britto Happy Cat design. Material: Polyester. Size: 42 x 33 cm. A real travel bag for an attractive price. Duffel bag with drawstring in Britto Cat design. Material: Polyester. Size: 42 x 33 cm. A real travel bag for an attractive price. Handy Tote bag by Britto, with inside a zip pocket. This bag features double handles. Britto patterns all over. Folding umbrella Deeply in Love. Artist/designer: Romero Britto. Diameter 100 cm. Easy to carry with you in a bag. With cover. 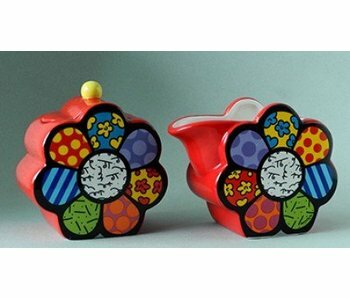 Colorful tableware in pop-art style, including special shaped teapots and mugs. We have a wonderful selection usable items in our range, like teapots, umbrella's and tote bags. A great gift item and for art lovers. Romero Britto (born 6 October 1963) is a Brazilian Neo-pop artist, now living in Miami since 1987. He is known for his cheerful colorful paintings and sculptures. With his new way of expression, he reflects his optimistic, positive attitude towards life. Here he can be influenced by old and modern masters. Romero Britto combines elements of cubism, pop art and graffiti painting in his work. His collectors include celebrities such as Arnold Schwarzenegger, David Caruso, Pelé, Andre Agassi, Senator Ted Kennedy, Eileen Guggenheim, and many more. Britto has completed a lot of corporate works for Movado, Disney, Enrico Coveri, Pepsi, the United Nations, BMW and Royal Caribbean Cruises. Britto has one main art gallery in Miami, on South Beach on Lincoln Road.